The Farmhouse is a great place for breakfast or lunch. 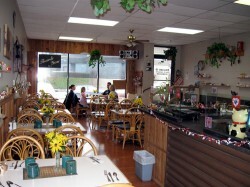 We serve an All-Day breakfast in our warm and friendly atmosphere. Our menu is 'home-made" style. You'll delight in our farm-fresh eggs and golden pan-fries, they are simply delicious. Enjoy your lunch with one of our home-made soups and sandwiches or, our special burger and fresh cut french-fries. Located directly across from Thrifty's and Quality Foods, we have lots of parking.